Colonial Williamsburg’s Holiday season officially begins with the Grand Illumination. The Revolutionary City lights up with fireworks, bonfires, and candles twinkling in the windows of buildings. Enjoy live music on five stages throughout the Historic Area. Live music and entertainment begins at 4pm. Historic taverns as well as special food trucks, will be available for a full range of food and drink options. 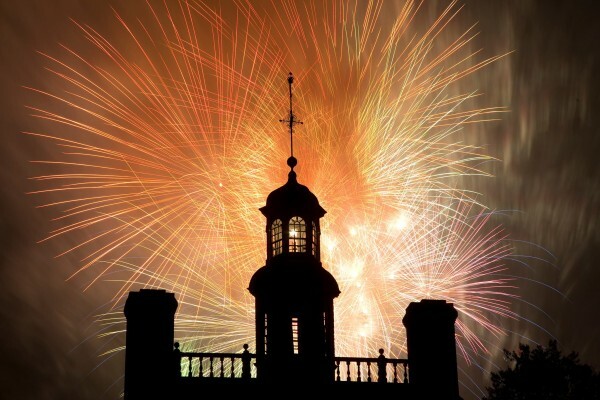 And of course — fireworks displays from the Capitol, the Magazine, and the Palace! The vintage swing sounds of Truetone Honeys & 504 Supreme salute the era of the Williamsburg Restoration. Classic holiday favorites performed a cappella by the W&M Gentlemen of the College. An immersive celebration of joyful song by The Jubilee Performers. Explore the rich heritage of traditional southern Appalachian tunes & songs with The W&M Appalachian Music Ensemble. An enchanting program of handbell selections by the Westminster Ringers. A celebration of popular 18th Century tunes by Colonial Musicians. A patriotic seasonal Concert by the Colonial Williamsburg Fifes & Drums. “Goodwin and the Ghost” a Williamsburg Christmas Tale. The Illumination of the Raleigh Tavern Ceremony. The Illumination of the George Wythe House. A grand display of fireworks to be followed by a Glorious Procession of Fifes & Drums along The Duke of Gloucester Street, beginning at the Colonial Courthouse & culminating at Botetourt Street. The lighting of candles in the windows of shops and homes along the Duke of Gloucester Street began in 1934 during the Colonial Williamsburg restoration. This timeless tradition continues with a symbolic ceremony featuring the heart-stirring pomp & pageantry of the Colonial Williamsburg Fifes & Drums.